Use the Import Comments button located in the Syncing tab in the plugin admin settings. This feature requires your API app credentials in the Site Configuration section before the import can be started. 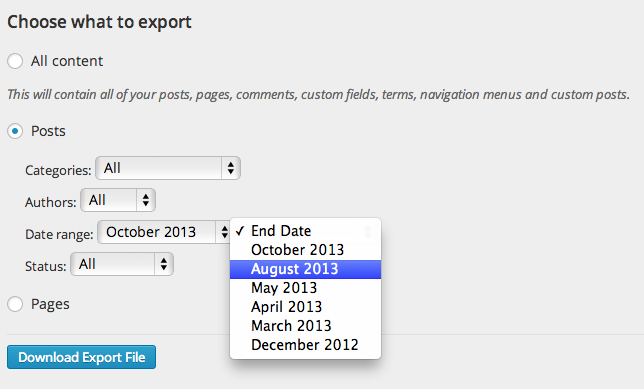 This will automate the export (from WordPress) and import (to Disqus) process. Note that imports can take up to 24 hours to complete. If the Automatic Import method does not work for your site, use the Manual Import option below. Deactivate all plugins except Disqus at your WP Dashboard > Plugins page. Export your WordPress site in WXR format at your WP Dashboard > Tools > Export. 3. Import your exported WXR file. Troubleshoot your import file if you run into any errors. Note that imports can take up to 24 hours to complete. Make sure the files you're importing are valid XML. You can use the W3C xml validating tool to check. Compressed files (e.g. .zip, .gz) can't be read by default, so make sure you've decompressed these before uploading them. The importer will filter out duplicate comments unless you've changed some of the comment data. Email addresses are unique identifiers in Disqus, so make sure each unique user has their own email address before importing. Otherwise all comments will appear from the same user. Imported comments can't be permanently deleted. Consider following our guidelines for development sites to make sure the data you're importing is correct. You can register a new forum if you have imported the wrong comments. I'm not seeing custom avatars attached to my comments We no longer support Gravatars associated with the email address used when importing guest comments.